What is this piece of artwork telling you? Is it art? Is it vandalism? This exercise was intended to gauge initial thoughts about student's reactions to graffiti. The first image is stock photography from the internet, but the second image was taken here (recently) in Fort Collins and the third was taken in Germany this summer. Student responses around the topic covered a wide range of thinking, captured in the selected responses below. What do you think? I think this is art because (1) it is not pretty, but you have to think (2) if you question everything you will get smart and (3) last but not least it looks deep into me. I think that it is a work of art because it is a question and other artists can talk to him and answer it. I think this is both [art and vandalism] because words are art and I think everyone has their own way of art but people shouldn’t do that to other [people’s] private property. What this piece of artwork is telling me is that you should question everything so you can understand more. I think it’s not artwork because it’s more like advice or a thought. Don’t stop thinking…it is art and emotion. I think it is vandalism. I think because it is just writing on the wall. How would you like to have tons of writing all over your wall? Some of it could be bad and inappropriate. It would not be nice for that to happen to you. That is why this is vandalism. I don’t know why someone would draw that on the wall, but I am pretty sure they have something to question. I think it is art because it has words in it and it is using ideas to make a painting. This is telling me to question everything. I think it’s vandalism because it isn’t even a drawing. It’s telling me to question everything. I think it is art because I think mostly everything in the world is art. I don’t think it’s vandalism because Ms. England taught us about culture and graffiti. She said graffiti is just someone marking its territory for space to do art. Yes, it is art because someone else did it and I think it is fabulous. It is not vandalism because it’s a message. It’s there for a reason. It is street art because (1) it is a question (2) it is not swears nor mean. (3) it looks like it says believe in yourself. Yes, it is art because it is a drawing and I think drawings are art. No, I don’t think that is vandalism because it’s not on a piece of private property. It is telling me to question everything. I think it’s because if somebody ever makes you go somewhere and trying to trick [you]. And I do think it’s art because writing can be art as well and I don’t think it’s vandalism because it’s writing. I say it is telling me to question everything. My mind says vandalism. That to me doesn’t mean art. I say it is telling me to question everything. My reason is that it says that in the picture. It’s not really art in my eyes, mostly because it’s just words. Yes, I’d say it’s vandalism; it’s more of a message or a text. I think it is art because anything can be art. Words can be art. Location is art. This picture is telling me why people question everything. This picture is not art at all. All it is, is a question. Who does that?! And this picture is vandalism. It looks like a pathway to a secret club or something like that. This piece of artwork is vandalism to me because it is just words and not a picture. Another reason it is vandalism is because I don’t like to look at it as much as real art. One last reason is that the words are trying to cover the billboard or try to make people not notice the billboard. That is why I think it is vandalism. It is art. I think that people should have the right to do what they want in writing. 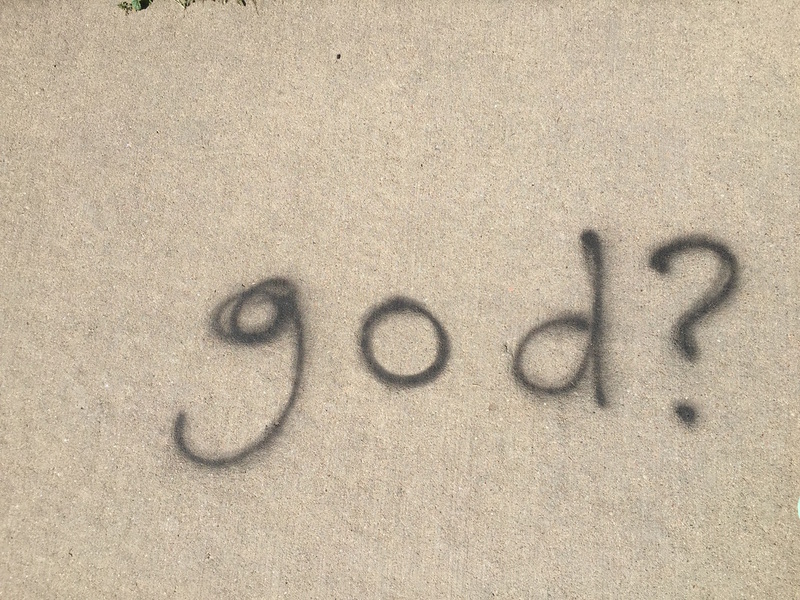 I think that this is vandalism because there is a “?” after God like it is a mystery if god is not real or is real. I think that the question mark is something I can't describe. I also think to someone who doesn't believe in god it could be mean. He is asking god a question to help his family. I think it's vandalism and some people [might] take that as offensive. I don't think it is artwork because it's more of a thought and to me it looks more like a thought. This artwork is telling me that this person thinks that god doesn't do that much. I think writing god? on the sidewalk is art because I think god is a beautiful person. What I mean by beautiful is he does good things and if this person is writing god on the sidewalk he or she is saying he is beautiful. Nooooooooooo is he? what is he? dead or alive? That is VANDALISM!! It is vandalism because some people might not want to see that. Also, it is just writing. It might be asking "why god?" or "why was god created?" or "why is god our boss?" In my opinion, those are all BAD things. It is also taking up public space. That is why I think it is vandalism. I think these people are Mormon or someone who is from a different country. I think that it is art and it's telling me that if god is real. It is art; it is on Mrs. E's sidewalk. This is vandalism. It's vandalism because all it says is god. Also, it's on city property!!!!!! It's telling me I might be questioning god maybe? I don't really think it is art because art is supposed to be colorful and pretty. This is not very colorful or not so pretty I think. I don't think it is vandalism because it's like the same as sidewalk chalk. It is telling god! This person believes in GOD! I think it is fabulous. It's not vandalism because it's a message. It's saying is god a fantasy or is he real. I think this is vandalism because it is unrespectful to ones that believe in god...it can be hurtful to people who are religious. It is telling me that the person who wrote that doesn't know if they believe in god or not. I think that is art because it was a little loopy. (the letters) I don't think it's vandalism because it doesn't have a name on it and it's not on private property. It is telling to question god. I don't know why but I think it's because some people don't know if god exists or not. And I don't think it's art because it's a question, and I think that it is not vandalism. I say it is both. Why I say its both because God is art but the question mark is a vandalism. It's asking a question; I think that it's asking is christianity real. I say that because it says "God?" the question mark gives is away. It's not art, it's a message. Yes, it is vandalism, its just 4 characters and also it's just a question. Vandalism, because it's just a word. I think this is vandalism because it has a question mark at the end and is kind of plain but I also think it is good--a little bit artish. I think this person was confused and mad or sad but he/she wanted to express his/her feelings just to get it out there into the world. That is why I think it is art and vandalism but a little more vandalism. I think this is vandalism because many people may not believe in god. I definitely think this is art because it's saying a nice thing to people. I think be free means don't be afraid to be you. Don't act cool to fit in. You are perfect the way you are! I think they put it there for people who think they're not great the way they are. I think the third image be free is art because those words aren't bad; they're telling you to be free wherever you are. This artwork is telling me to try to be free. This is artwork because it is telling you a thought so you can be free. It is telling me to be free and have freedom and do whatever you want. It's vandalism and you cannot do whatever you want. Live how you want. Live with who you want. Do not bow. Do not surrender. Fight on. This is vandalism, taking up public space. I think it's for people to avoid slavery and enemies' rules and contingency. It says Be Free because maybe people want to be free from being slaves and to stop being mean. I will be free. I love art. It is vandalism. It say be free. Also, it is on a thing someone owns. It's telling me to be free. I think its art because art gives you a good feeling and this photo does too. I do not think this is vandalism because vandalism makes you like, "hey! that's mean!" But this gives you a nice, free feeling. This person wants to be free from bad people. It is not vandalism. It's a message. It's there for a reason. Street art because it is friendly, it is telling you not to let people boss you around. Street art because it gives a message. It's telling me to be free. I think it is art because it had little spirals. I don't think it is vandalism because it's a good message and it doesn't have a name. It is telling me to be free. I think it is because for people to have freedom. And I do think it's art especially because it has a drawing behind it. And I do think it is vandalism because it has a drawing. I say it's not art. It's not vandalism. It's a text. I say again, it's not art, it's a text because it's just letters. It's truly not vandalism, it's a "hopeful" text/message. I think it's art because it has more colors. This is absolutely art! It tells you that we can be free! It speaks from the heart. I think this picture is art and vandalism but more art. First, it could be encouraging but is still on/in a public space. Next, it has different colors and it is kind of pretty. Last, you could see the ugly marks in the corner. That is why I think it is vandalism and art, but more art.